Reading this book may seriously put some at risk – at risk of facing latent prejudices and stereotypes caused by selective reading or biased reporting on the Middle East. I am delighted that Hodder has had the courage to publish Brother Andrew’s book Light Force in Britain, because it could not have been an easy decision. There will be many who will wish this book does not receive the wide readership it justly deserves. Elizabeth Elliott, for example, lost many ‘friends’ when she wrote her similarly controversial book, Furnace of the Lord (published in 1969 also incidentally by Hodder & Stoughton), in which she describes her empathy for the suffering of the Palestinians and her overriding concern for people rather than so called ‘prophecy’. In his first book, God’s Smuggler, Brother Andrew describes how the Lord provided an open door through the Iron Curtain enabling Western Christians to sustain and equip the suffering Church in Eastern Europe to withstand the onslaught of atheistic Communism. Eventually, however, he became too well known, a marked man. Brother Andrew was therefore led to focus his ministry on supporting another persecuted Church, this time in the Middle East, caught between Jewish Zionism and Islamic fundamentalism. While many have succumbed to the temptation to make an all too brief visit and write yet another superficial account of their impressions of the Arab-Israeli conflict, Brother Andrew has waited 35 years to publish his diary, revealing with great candour, his many unpublicized visits to strengthen the suffering Church. This entry was posted in Middle East and tagged Brother Andrew, Jews, Light Force, Middle East, Palestine, Palestinians, Reconciliation on December 6, 2013 by Stephen Sizer. 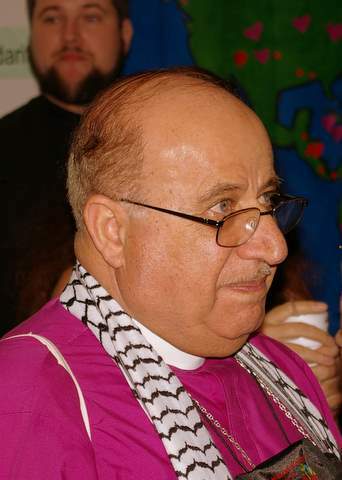 This entry was posted in Anglicanism, Israel, Middle East, Palestine and tagged Anglicanism, Bishop Riah, Bishop Riah Abu El Assal, Church of England, Middle East on November 25, 2008 by Stephen Sizer.